Happy 2017! It sounds surreal just typing that! It may take me a good 6 months just to get in the habit of writing it. haha. With a new year comes many things: a fresh start, a holiday detox, tax season, and of course RESOLUTIONS! I still haven't decided how I feel about New Year's resolutions. In one way, I feel like it shouldn't take a special date for you to make desired changes in your life, but then I also like the idea of a yearly reminder to reset and make a more cognizant effort to just go after the things you've been wanting to achieve! The past couple of years I've embraced resolutions. Some of them I've kept and been successful at, others I've failed miserably at. (Just being honest!) Regardless of the outcome, they've helped create a certain mindset and attitude of change and progress within the new year, which I love. For the 2017, I have made quite a few resolutions. I like to make a resolution for each area of my life: spiritual, relational, physical, personal, financial, and professional. I am a very goal-oriented person, so it's almost like a goal setting season for me! One of the resolutions that always makes it to my list has to do with money. Even though I am frugal, there's always more money to be saved, excess to be cut, and wiser choices to be made. For this week's post, I wanted to give you reasons why you should add "Being more frugal" to your New Year's Resolution list! 1. Spend Less, More Cash! I NEVER carry cash around these days. It's so easy to just swipe a piece of plastic! (And have you used Apple Pay?! AHHMAZING!) But when I do carry cash, It seems to evaporate so quickly! It really makes me more aware of my spending habits. When you develop frugal shopping habits that save you money, you're adding cash to your account! Just think, if you were planning on buying a dress for an event, and you waited for it to go on sale, so instead of paying the original $150 and paying $35, that's an extra $115 in your pocket! That money can be used towards other things you actually need or can be saved. A little bit goes a long way! 2. More Bang For Your Buck! Ultimately all the things in your closet will wear and go out of style. I easily get bored of items of clothing, so I often feel like they are here today, gone tomorrow! At the end of the day, clothes are just clothes. They don't last, you won't carry them to your grave. I don't know about you, but I want to spend my money on things THAT MATTER! It's something that is always on the top of my mind. I am always pushing myself to think about new ways I can be generous or spend my money in a way that isn't selfish and that does good. So the more frugal you are, the less money you waste on temporary things like clothes or material possessions. This also opens up your wallet and gives you space to be more generous! Now I want to highlight one of my recent frugal purchases! Over Christmas break, I snagged a great deal on three pairs of shoes at DSW. They are all spring/summer styles, so it's a great example of buying during the off season for a fraction of the price! Now, I have to admit that I didn't REALLY need any more pairs of shoes, but at an additional 80% off the sticker price I couldn't pass them by! The Aldo suede bow pointed-toe flats were originally $90 and I got them for $13.99! 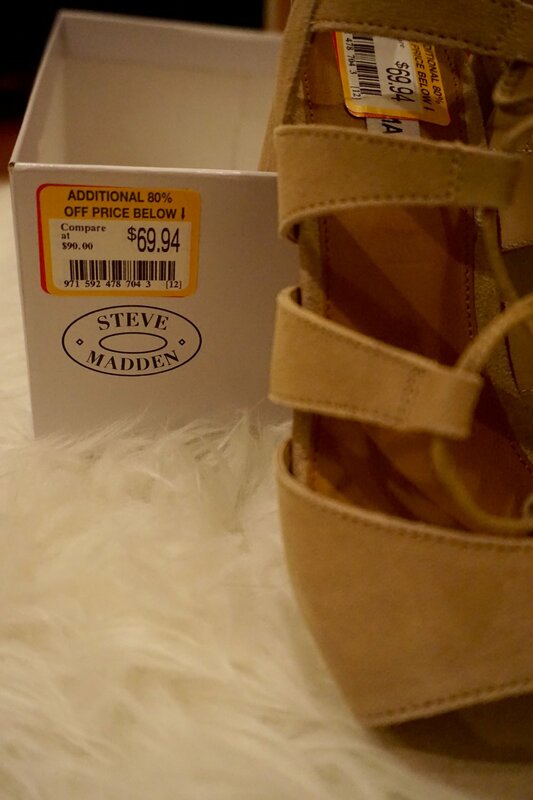 The Steve Madden open toe suede, block heel lace-ups were originally $90 and I got them for $13.99 as well! And the Sam Edelman wooden chunky heel sandals were originally $110 and I got them for $11.99!